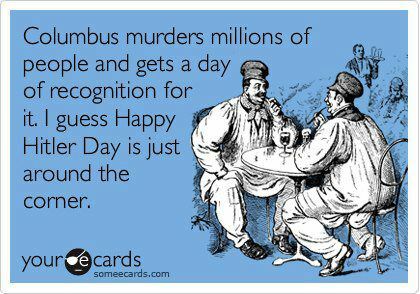 Columbus Day. A day where many Americans celebrate the ‘discovery’ of America. Why do we glorify it? FROM CHRISTOPER COLUMBUS JOURNAL. WRITTEN AFTER ENCOUNTERING THE ARAWAKS OF THE BAHAMA ISLANDS. For more shocking first hand accounts of the terror brought upon the indigenous peoples of the ‘new world’, please visit this link from ‘Howard Zinn on History’. This video below does a better job of summarizing why we shouldn’t celebrate Columbus. Please watch and visit the website at the end of the video.